For string concatenation in SQL Server, developers can use string aggregation String_Agg function with SQL Server 2017. Before SQL Server 2017 String_Agg string function to concatenate string values, either CONCAT string function or "+" expression was used. 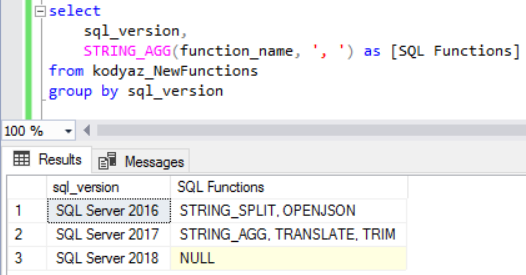 If the SQL developer wants to concatenate text column values of different rows of a table, then user-defined string concatenation SQL functions were developed. New SQL Server string concatenation function STRING_AGG concatenates string expressions by seperating each string piece with a seperator expression. What is an additional function with String_Agg string concatenation syntax is the optional Within Group clause. Within Group clause enables T-SQL programmers to order the string expressions according to order by expression list, in ascending or descending order. After we talked on String_Agg function syntax, let's make some SQL samples to understand how developers can use this new SQL Server 2017 function. By the way, most common seperators used frequently by SQL programmers are "," comma, ";" semi-column and "|" pipe characters. The function 'STRING_AGG' is not a valid windowing function, and cannot be used with the OVER clause. SQL programmers are lucky to use the Within Group optional clause to order string fragments used in String_Agg string concatenation SQL function. Let's now return to the first example query where all function_name column values are concatenated into a single SQL string value. As a SQL programmers I simply want to order all values without any group information. Here is sample data for SQL query where an emailing list will be created and email addresses will be concatenated into one string variable seperated with ";" semi-column as emailing programs expect. In this example, we will test how String_Agg SQL Server 2017 string concatenation function works with NULL column values. Let's continue our sample using SQL concatenation function other SQL aggregation functions like Count() etc. You'll realize when you look at the last line. Altough the count is 2, there is only one email address in the concatenated string. This difference is because of the NULL column values in our sample data. Count() function calculates the NULLs too. But string concatenation function String_Agg does not show any value for the NULL strings.